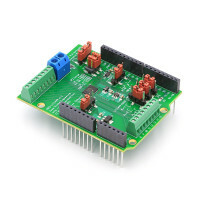 The ARD-LTC1863 is an Arduino compatible shield that contains a Linear Technology LTC1863 12-Bit, 8-Channel, 200ksps ADC. It can be configured to measure 8 single-ended voltages, 4 differential voltages, or any other combination. The onboard EEPROM can be used to store calibration and configuration information directly on each ARD-LTC1863 board. A 6-byte EUI-48-compatible globally unique ID number is also provided. 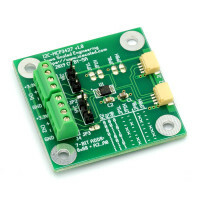 The ARD-LTC1863 can be used with other Arduino shields to make a simple, yet quite versatile, data acquisition system. For a higher resolution (16-bit) version of this shield, please see the ARD-LTC1867. The ARD-LTC1863 uses the programming header for the SPI wires (MISO, MOSI, SCLK), D3 for /CS to operate the ADC, and the two TWI/I2C pins (SCL and SDA on modern r3 boards, A4/A5 on previous designs) for the EEPROM. Please check carefully for pin conflicts. Most standard form factor Arduino or compatible boards should work with the ARD-LTC1863. This includes the Arduino Uno, Arduino Mega, and Arduino Ethernet. The Arduino Leonardo uses pin D3 as the TWI/I2C SCK pin, and thus JP6 must be set to use D8 as the chip select line. Additionally, onboard level shifters for the SPI I/O lines are now included, so Arduino boards using 3.3V I/O, such as the Due, Zero, etc. can be used directly with the ARD-LTC1863. The Arduino Mini, Micro, and Nano, do not provide the standard Arduino header connectors and thus cannot be directly used with the ARD-LTC1863. After developing several products focused on data acquisition, like the MRBW-RTS and a few currently in development like the MRB-DCCM (DCC Meter) and MRBW-DAQ (Data Acquisition node), we realized some of the ICs used in those designs would be useful on their own. 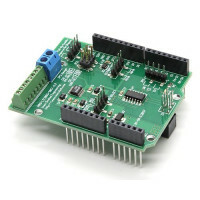 To enable rapid development with these ICs, a series of ArduinoTM shields was created allowing you to easily implement a wide variety of data acquisition applications.